ISRO Propulsion Complex (IPRC) located at Mahendragiri, Tirunelveli District, Tamil Nadu is a lead Unit in the area of Liquid and Cryogenic Propulsion for ISRO’s Launch Vehicle and Spacecraft Programmes. IPRC is responsible for Research & Development of Earth Storable/Cryogenic & Semi Cryogenic Propulsion Systems; Assembly, Integration and Testing of Engines, Stages for PSLV, GSLV and GSLV MKIII Launch Vehicles, Associated Control Systems, Sub-systems and Components of Launch Vehicles; High Altitude Testing of Upper Stage Engines and Space Craft Thrusters; Production and Supply of Cryogenic Propellants for ISRO’s Cryogenic Rocket Programmes; Supply of Storable Liquid Propellants for ISRO’s Launch Vehicles and Satellite Programmes. IPRC also carries out Research & Development (R&D) and Technology Development Programmes (TDP) towards continual improvement of its contribution to the ISRO Space Programme. Applications will be received ON-LINE ONLY. Physical applications will not be entertained. For applying ON-LINE click on the Name of the Post for which application is to be submitted. Fill in all the requisite information correctly. After filling the information, there will be an opportunity to verify your credentials. If any corrections have to be made, click PREV STEP button and make necessary corrections. After verifying and ensuring that the information entered are correct, click SUBMIT, after which no modifications could be made. The applicants should furnish their e-Mail ID CORRECTLY and COMPULSORILY upon ON-LINE registration. All further intimations to eligible candidates for Test/Interview will be sent through e-Mail only. After confirmation, your ONLINE REGISTRATION NUMBER will be displayed on the screen. Carefully note down and preserve this ONLINE REGISTRATION NUMBER for future references. A Personalised Fee Payment Challan, in triplicate, containing the Name of the candidate, Registration Number, Receipt Account Number, Advertisement No. and Post Code; and Application Acknowledgement Form will be automatically generated while registering ON-LINE application. The candidate has to download Personalised Fee Payment Challan and Application Acknowledgement Form from the link given in the Advertisement page by providing necessary details such as Registration No. and Date of Birth. The candidates may visit the nearest branch of State Bank of India (SBI) for remittance of application fee on any working day between 05.08.2016 and 17.08.2016. Upon remittance, one copy [Bank Copy] of the Challan form will be retained by the Bank and remaining parts [Applicant Copy] and [ISRO Copy] will be given to the candidate. 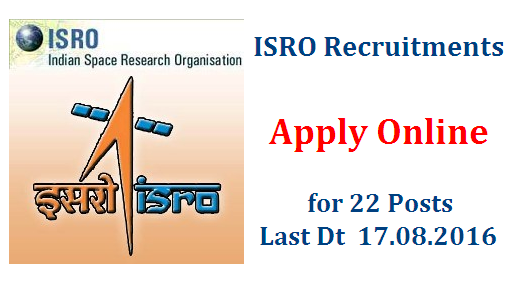 THE ADMINISTRATIVE OFFICER RECRUITMENT SECTION, ISRO PROPULSION COMPLEX (IPRC), MAHENDRAGIRI POST, TIRUNELVELI DISTRICT, TAMIL NADU - 627 133. Applicants who are currently employed under Central/State Govt./Public Sector Undertaking/Autonomous Organisation should send the confirmation copy generated after registering the ON-LINE application Through Proper Channel. If they anticipate any delay in forwarding their applications, they should send an advance copy of the print-out to the address mentioned above so as to reach before the due date. However, such candidates will be allowed to attend the test/interview only on production of No Objection Certificate from their employer. The above documents should reach within seven days of ON-LINE registration or in any case not later than 26.08.2016 16.00 Hrs failing which the application registered ON-LINE will not be considered. The applicant need not send any other documents such as copies of certificates/mark lists in proof of educational qualification, work experience, age etc. On-line application will be accepted until 17.08.2016, 16:00 Hrs.